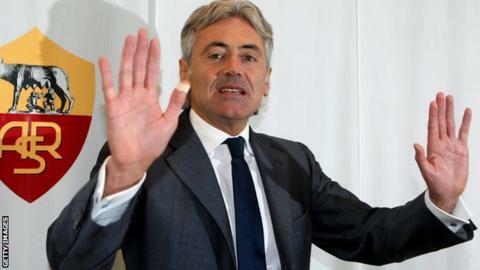 Roma general manager Franco Baldini has distanced himself from a new technical director job at Tottenham. Chairman Daniel Levy is reviewing how the club goes about player recruitment and wants to create a new position. Baldini, 51, speaks excellent English, has contacts throughout European football and has a good relationship with Spurs boss Andre Villas-Boas. But he said: "I have an obligation over here with Roma. It is a long project to which I am committed." Former Barcelona technical director Txiki Begiristain has also been linked with the job. Baldini rejoined Roma, the club he had served as director of football from 1999 to 2005, as general manager in July 2011. Villas-Boas, who was linked with the Roma manager's job last season, has confirmed he would be comfortable with the introduction of a technical director at Tottenham. "I have worked with one at Porto and Academica and had no issues with that and I certainly promote that," Villas-Boas said. "In the end the structure that surrounds the football club is down to the chairman. It is not up to me to decide, it's up to the chairman. There are discussions and talks but in the end it is a club decision. "I certainly think he is looking to further evolve in terms of the structure that surrounds the club." Former manager Harry Redknapp previously had responsibility for identifying signings, in consultation with Levy. Before that, director of football Damien Comolli recommended transfer targets, as well as having overall responsibility for the club's academy, scouting and medical departments. Comolli was dismissed in October 2008 and his role was scrapped.